My 2014 project is to refurbish my NW Europe British forces for 1944-45. These are some of my very first models and conversions and it shows. The models just now are in a variety of shades of green paint, unpainted plastic and some in brown. Not a very uniform appearance at all. The quality of build and painting is even more varied. Some were bought and built way back when I got half a crown a week pocket money! I was able to secure a large stock of Humbrol 30 Green Acrylic paint pots at a reduced price and also a couple of cans of spray so the colour was decided upon. Not the most realistic "British Army Green" but close enough for my purposes as it almost exactly matched the colour of the unpainted Airfix kits of the early period. So nostalgia was served! A "standard" look was intended right from the start so the vehicles were all painted in Humbrol 30 Green then washed with thin black, thin earth brown or a mix of black/earth brown. Finally dry brushed with Coat d'Arms Linen. Markings were kept to a minimum so that a generic appearance was maintained though some Divisional signs and Arm of Service markings will be used. The senior armoured regiment (red tactical signs). The standard Sherman regiment for our rules has an RHQ with a Sherman 105mm, a Crusader AA and 2 Stuarts; three sabre squadrons each of a Firefly (17pdr) and 3 Shermans (75mm). For later in the war when Fireflies were available in greater numbers additional models were made to make each squadron 2 Fireflies and 2 Shermans (75mm). The second Sherman Regiment (blue tac signs) - Sherman 75s and Crusader chassis by Airfix, Crusader AA turret balsa wood, paper and wire, Stuarts and Fireflies by Matchbox and Sherman 105mm by Fujimi. The third Regiment (yellow tac signs) is equipped with Matchbox Comets, converted Airfix Crusader AA and Frontline Resin Stuart V.
The Divisional Armoured Reconnaissance Regiment is equipped with Frontline Wargaming Cromwells, Challengers and Stuart Vs with a turretless Matchbox Stuart and since the photo was taken two Airfix Cromwells have been converted - one as the ARV and one as a Centaur AA with an S&S AA Turret. Picture later. Armoured Recovery, 2 Churchill ARV, and 2 each of two versions of the Grant ARV. More for HQs and towing 17pdrs and so on. 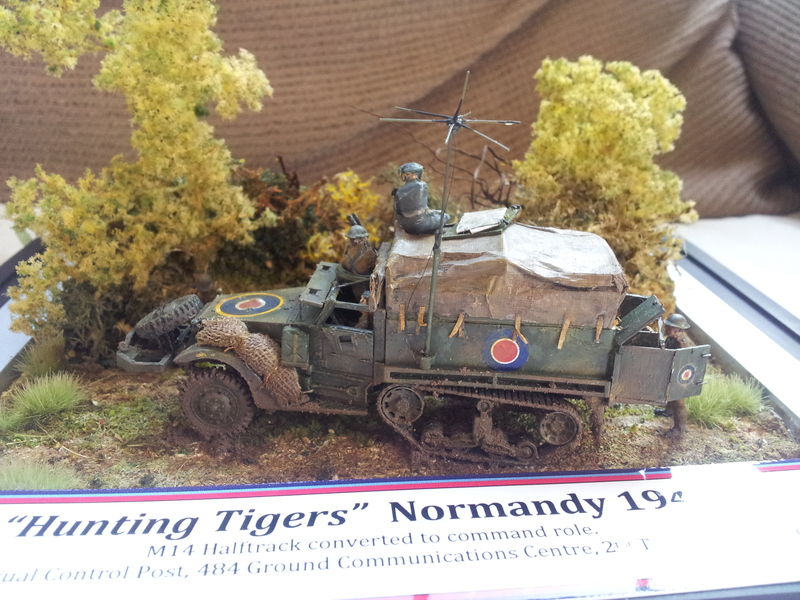 Fujimi M3 Half Tracks and a M3 Scout Car converted from an Airfix M3 Half Track. Armoured Car Regiment - Matchbox Humbers, one converted to be an AA Car, Frontline Wargaming Humber Scout Cars and White M3 Scout Cars. Heavy Armoured Cars - all bought damaged at a bring and buy stall at a show (two manufacturers) and restored - Staghounds one complete with Crusader turret with 75mm gun and crew, one complete with AA turret, two hulls with Airfix Crusader turret and Airfix Churchill gun and two with 2pdr. One AEC armoured car. Dingoes - two by Matchbox and one scratch built many years ago. My father directed Typhoon fighter bombers from D-Day to the end of the war. His unit had a "White Halftrack with a winch" and so from his description I made one.